Poulsbo Parks and Recreation has two gardening experiences for you in 2019! 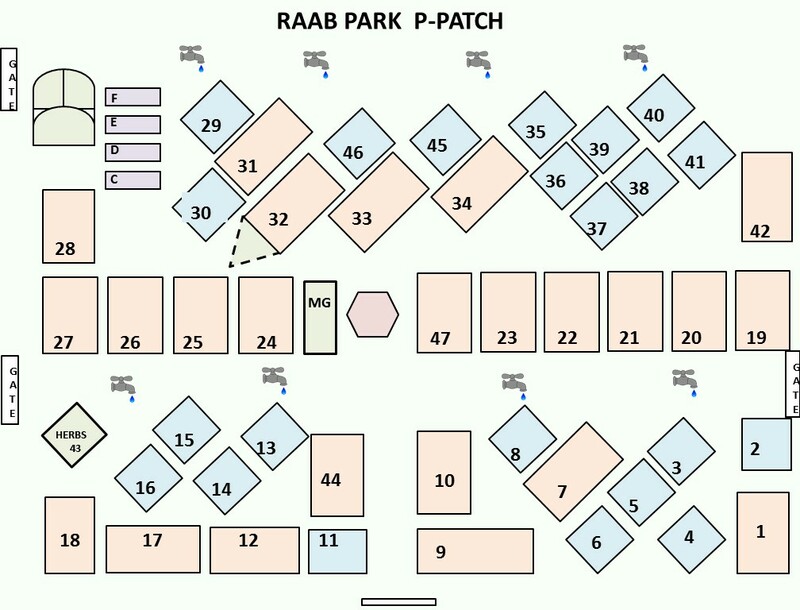 The 51 plots at the Raab Park Community P-Patch will be available for rent beginning March 1. The WSU-Kitsap Extension Office and Master Gardener volunteers maintain and provide the Children’s Demonstration Garden at Raab Park. The Monday summer program will begin in June! 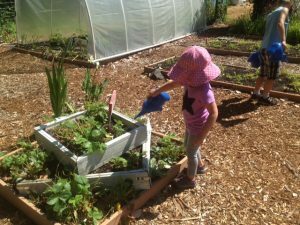 2019 P-Patch registration begins March 1 for new gardeners! 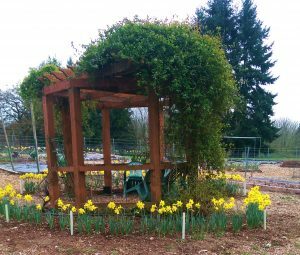 The P-Patch plots will be available to rent to new gardeners on March 1. The goal of this program is to provide community organic gardening space for the public. 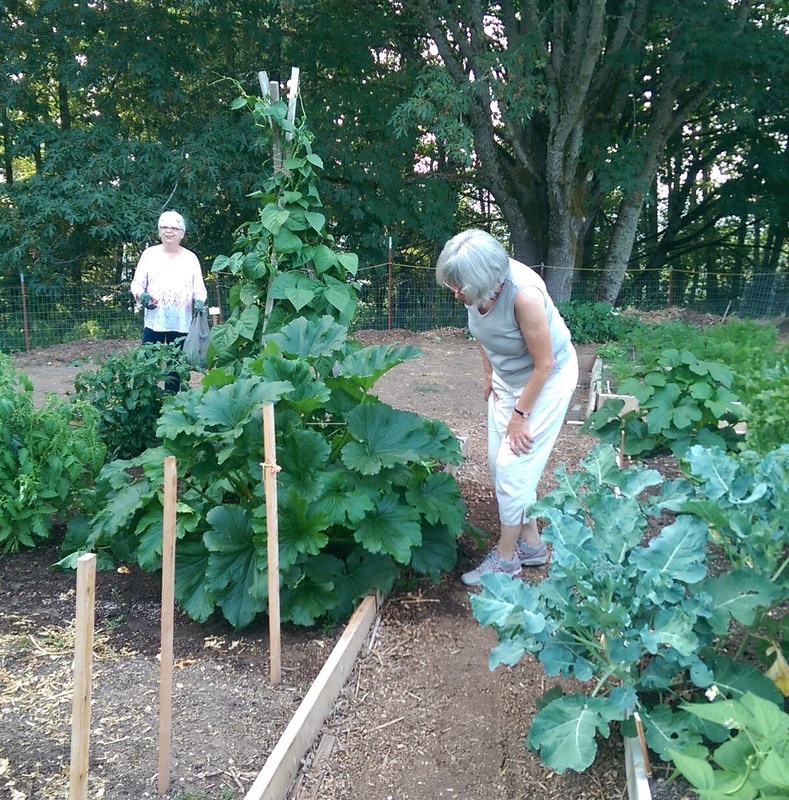 The P-Patch has 51 sunny garden plots available for rent each year in three sizes. Information and resources on organic gardening are provided as well as many hand tools and gardening implements. Produce may not be sold, but may be shared or donated to a food bank. 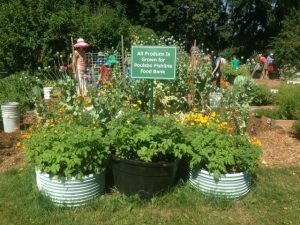 Gardeners donated 700 lbs of produce to Fishline in 2016! 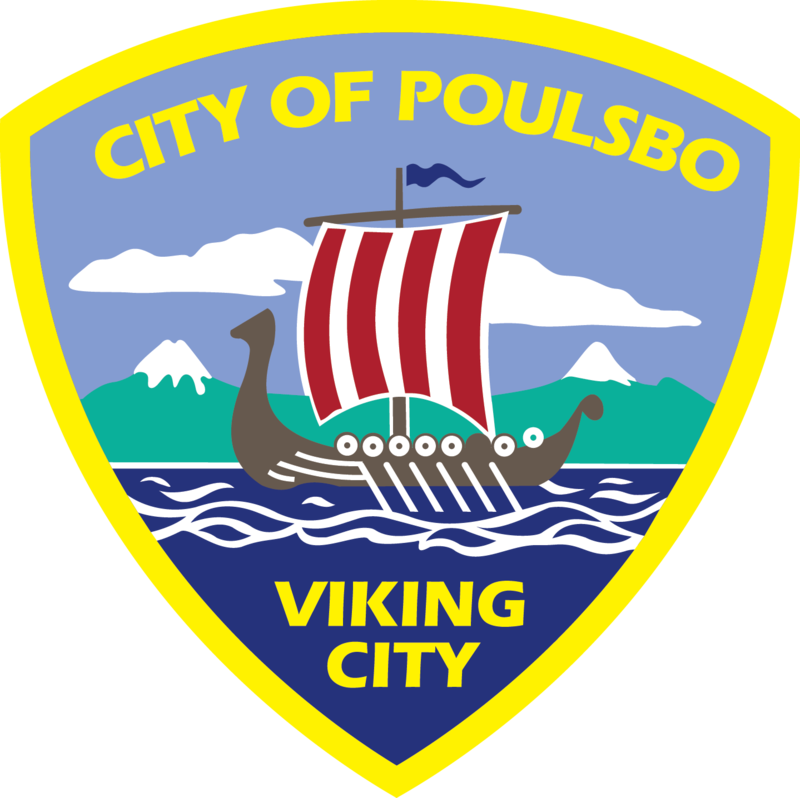 You may contact the P-Patch Coordinator Donna Rae George at poulsboppatch@cityofpoulsbo.com or call Poulsbo Parks and Recreation at (360) 779-9898 to register for a garden plot after March 1. 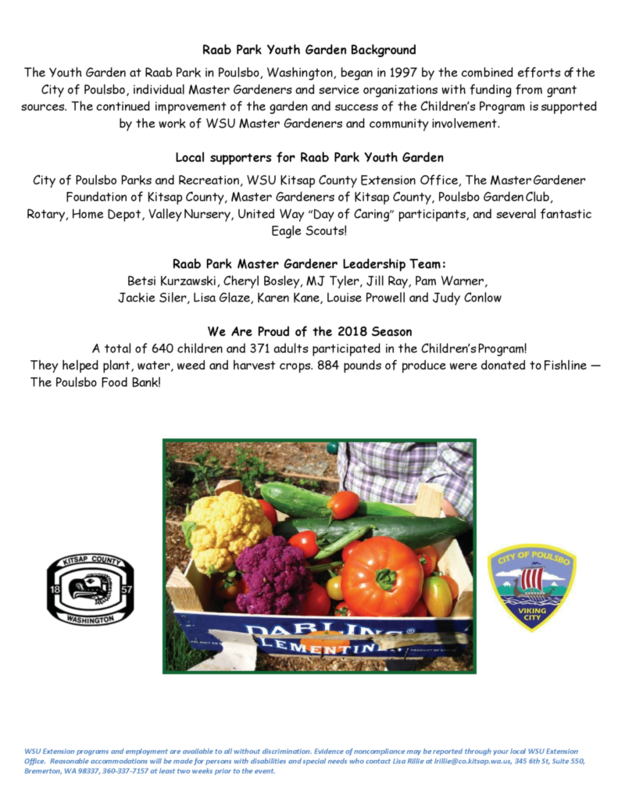 The Raab Park Youth Garden is a partnership between the City of Poulsbo Parks and Recreation and the WSU-Kitsap Master Gardeners. 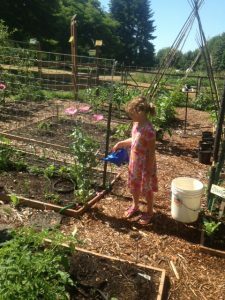 The Garden began in 1997 by the combined efforts of both partners and funding from local service organizations and grants. 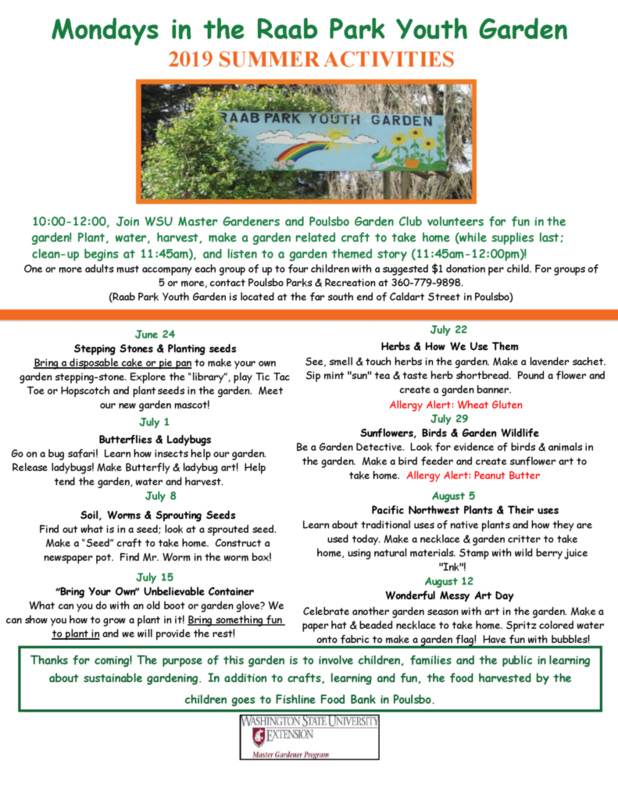 The continued improvement of the garden and success of the children’s program is supported by the work of WSU Master Gardeners, the Poulsbo Garden Club, the Master Gardener Foundation of Kitsap County, Suquamish Tribe, Poulsbo Kiwanis and Rotary Clubs, Home Depot, Valley Nursery, and community volunteers. The purpose of the garden is to involve children, families and the public in learning about sustainable gardening. In addition to participating in crafts, learning and fun, the food harvested by the children goes to Fishline Food Bank.